I found the following information very interesting. The area of Ireland where we are hiking is a Gaelactht Area. That is a region where the Irish language (Irish Gaelic) is the predominat language used in everyday life. Irish is the official language of Ireland and an official language of the European Union. Despite that, the number of native Irish speakers his consistently declined over the past 150 years and efforts have been made to preserve, promote, and revive the language both by the state and independent organizations. Around the turn of the 21st century estimates of native speakers ranged from 20,000 to 80,000 people. In the 2011 census 94,000 reported using Irish as the daily language outside of the education system. 1.3 million reported using it either in or out of school. In the Gaeltacht all place names are officially to be in Irish. 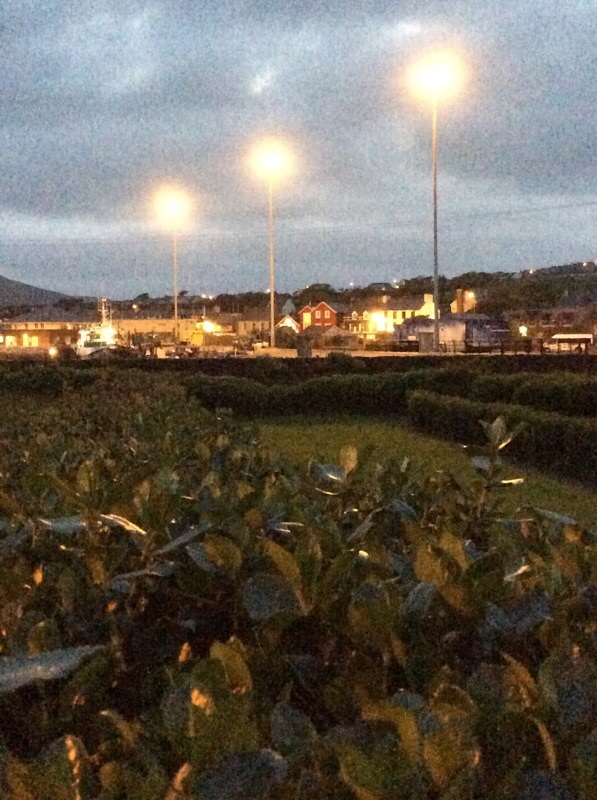 For that reason, in 2005 the Irish government announced that the English name for Dingle would be changed to the Irish, An Daingean. Also, no road sig ns could any longer display the English name in and/or outside of the Gaeltacht. Many people did not like this and it has led to some locals spray painting “Dingle” on signs that had only the Irish version of the name. When we were leaving Annascauul, we came across this sign. In case you can’t read the words that are on the bottom of this, I will tell you what it says. “The Dingle Way is a national a long-distance waymarks hiking trail which covers the circuit of the Dingle Peninsula. It is 179 km in length and starts and finishes in Tralee. It takes a fit adult 8 – 9 days to walk the way.” Today we did “Day 3” of it. We reached a beach next to the ruins of the 16th Century Minard Castle. It is made of sandstone. In 1650 Cromwell attacked and structurally damaged it. Mary and I spent time playing in the rocks around it. I added a stone to the cairn that was there. 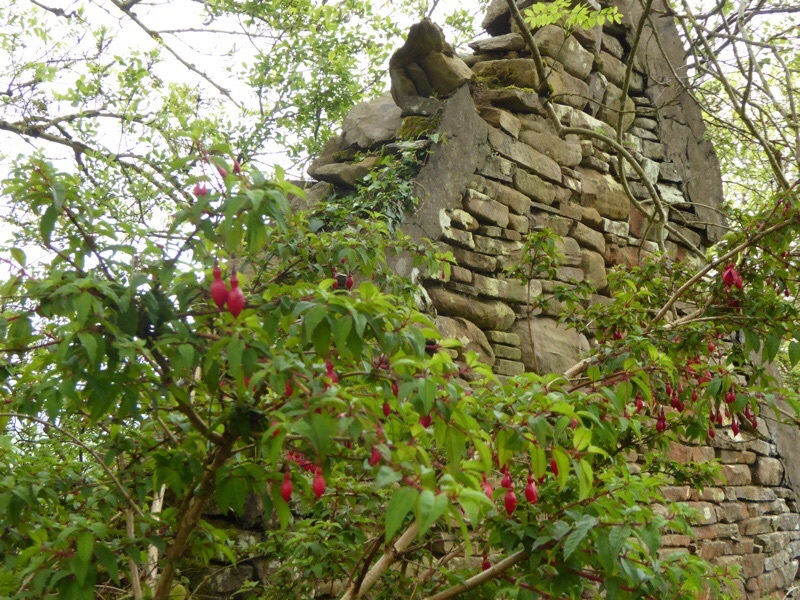 Many of the trails we walked in the morning were lined with Fuchsia so when we saw one against a stone wall, we had to stop to take photos. The sign on this gate made me stop and look, but we didn’t see a bull anywhere. Much of today’s walk was on tarmac; some across grassy fields; other parts through very muddy paths with cow piles – yuck. I was concentrating too much to even take photos. I used a farmer’s hose and water falls to periodically clean my shoes. The green fields still inspired me to keep walking. I love the green door behind these flowers. This cow climbed up high to see us. We crossed another couple rivers. The long walk down into An Daingean really seemed to exhaust me today. We had walked 22 km which certainly will not be the longest day. Mary is both much faster and stronger than me, but she patiently waits for me. Finally we rested in our spacious room on the 3rd floor of the Brosnan’s B&B. John and Eileen Brosnan’s are our very gracious hosts. At about 7:45 we went into town for dinner at Murphy’s Pub. I asked he waiter to help me pronounce An Daingean. After dinner we had to, of course, go to hear Irish Music at The Dingle Bay Hotel at Paudie’s Pub. This is is certainly a tourist town and it is nice to be here before the season begins. Tomorrow will be a new day. I think we walk along the coast and even on a beach. Categories: Walking Ireland 2015 | Tags: Dingle Ireland, Garfinny River, Irish music, Minard Castle, muddy paths, Owenalondrig River, Paudie's Pub | Permalink. I planted a hardy fuchsia today. Hope it grows as beautiful as the one you posted. Love the green green fields. All the picture of rivers look like creeks to me. Very beautiful however. Keep on treckin and keep healthy. I/m enjoying your beautiful nature photos, and comments. Keep on trecking! Nancy and friend, you are certainly at the heart of the Irish world now. i love this blog as I have enjoyed the others…but this one is magnificent! Great history lesson and beautiful photography! Fabulous Dingle town! Hope you can get to the Gallarus Oratory. Love the pictures!!! 😘😘😘 love u!